The cerebrum (cerebral cortex) is the largest part of the brain, with a heavily folded surface of gyri (ropy structures) and sulci (valleys). 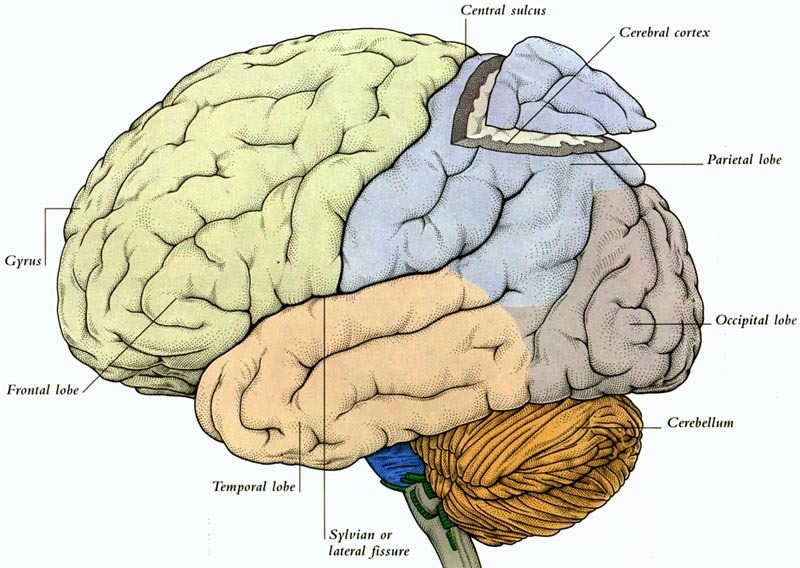 Areas on the Cerebrum are called lobes. The outer 2-6 mm is gray matter, while the inner tissue is a white matter as well as islands of gray matter (see slice). The frontal lobe is involved in speech, elaboration of thought and emotion, and skilled movements (Executive Functioning). The temporal lobes are involved in recognition of specific tones and loudness, and in memory storage. The parietal lobes are involved in perceiving and interpreting bodily sensations such as touch, pressure, pain and temperature. The occipital lobe detects and interprets visual images. Neurons of the cerebellum link with other regions of the brain and the spinal cord, facilitating smooth, precise movements, and controlling balance and posture. The brain stem is in gray at the bottom of the graphic. It is also involved in speech. Carbon monoxide poisoning can disrupt function in all areas of the cerebral cortex.